Thermal stability measurements - zero voltage drift. Following picture shows the ADC measurements done for 300 s period just after turning the power supply on (the board is not warmed up at the beginning, no signal attached to the input, offset set to zero). y-axis is the voltage measured by ADC (scaled to the input voltage range). 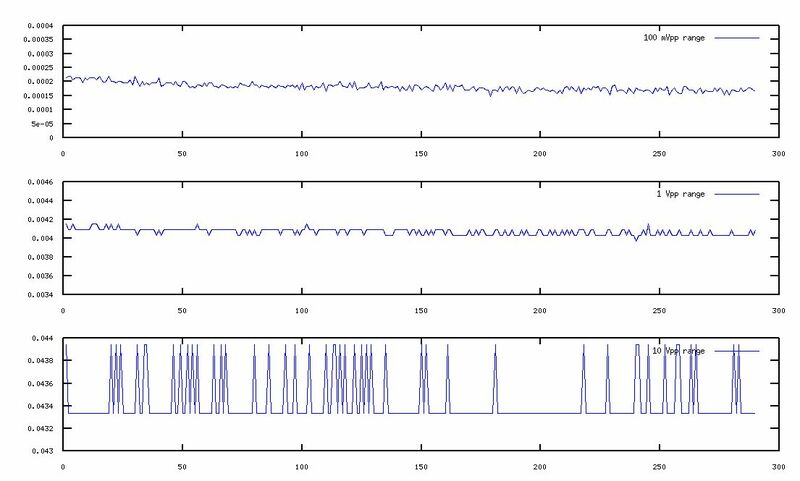 Each point is the average of 64 samples (to remove the noise from the signal). For the 100 mV range, the the voltage has hanged from 210 uV to 165 uV which gives the 45 uV change. Relating to the full scale it is 0.045 %, and about 7.5 LSBs. For 1 V range, voltage drift is 100 uV (about 2 LSBs) and for the 10 V range the drift is almost invisible. The results of the measurements are fully satisfying. Full temperature measurements, where the input is connected to precise voltage source, and the offset compensates it, would be done soon.